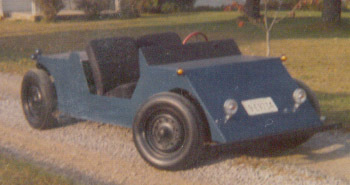 By the time I was in college, I was driving a completely street legal electric car, built on a full size VW chassis - with a custom styled wooden body. 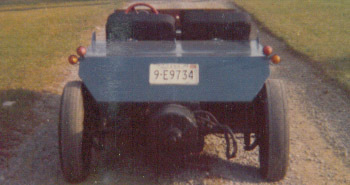 The car was power by a very old, 9 horsepower, series wound, 36 volt, forklift motor. 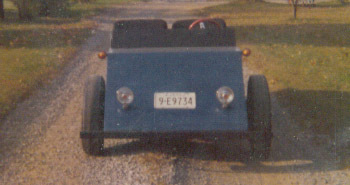 Top speed was 38 MPH (running on 36 volts) and 45 MPH (running on 48 volts). 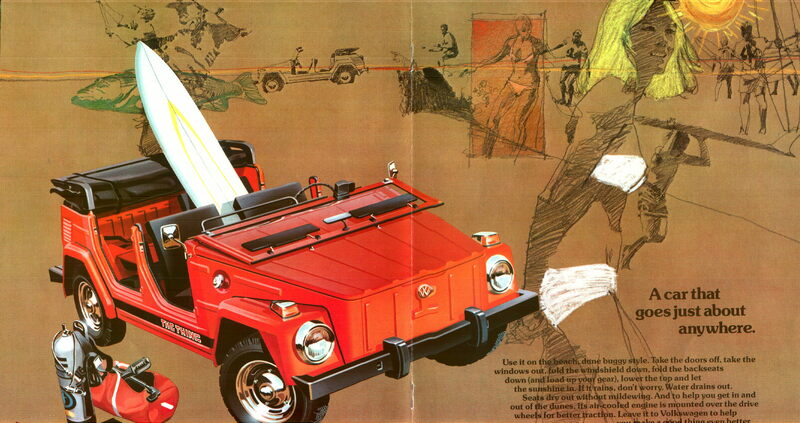 The car was fun to drive and a real "attention getter". It was even featured in the local newspaper. Over the years, and in various cars, I've discovered just how durable (almost indestructible) that old motor could be. I pushed it to the limits, and ran that old workhorse on as much as 72 volts, and as long as I kept the total power drawn the same (i.e. 36 volts at 200 amps or 72 volts at 100 amps) I did not even have an overheating problem! In a dune buggy, operating on 72 volts, I was able to achieve almost 70 MPH (with the windshield removed) and a range of over 75 miles at 55 MPH. 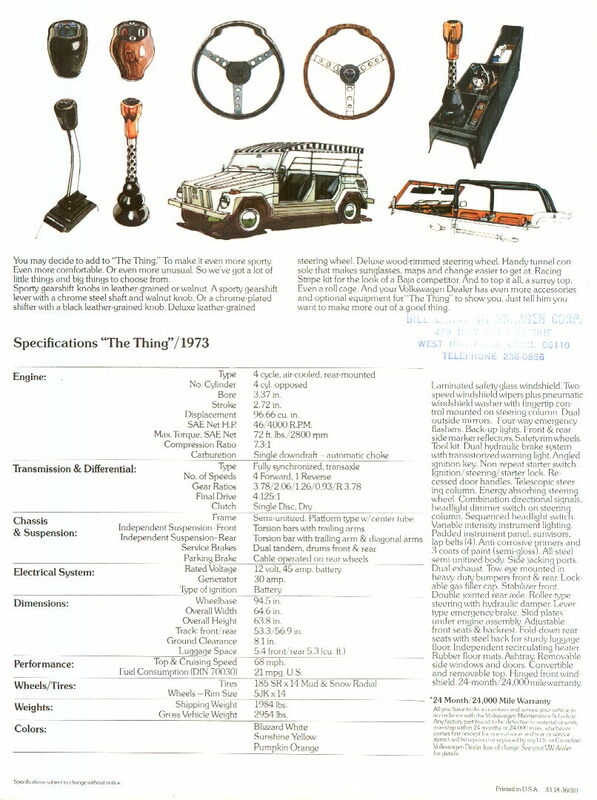 I consider this to be my first "real" electric car. 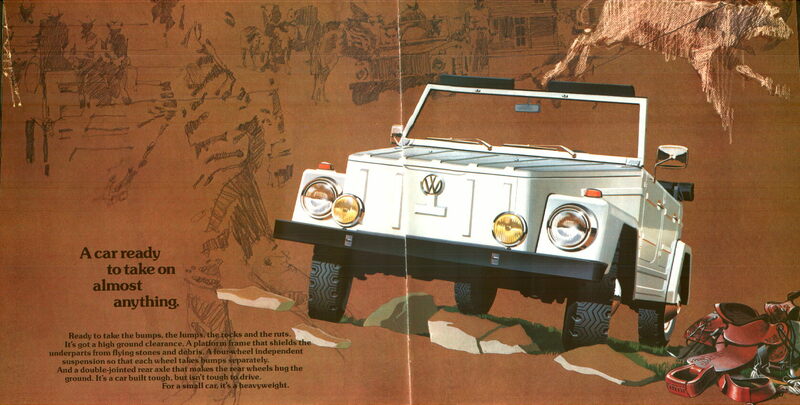 It was, by definition, still a conversion, since it was built on an unmodified VW chassis. 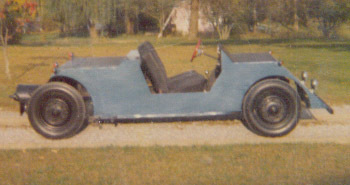 It had a custom built plywood body, that purposely left the motor exposed. 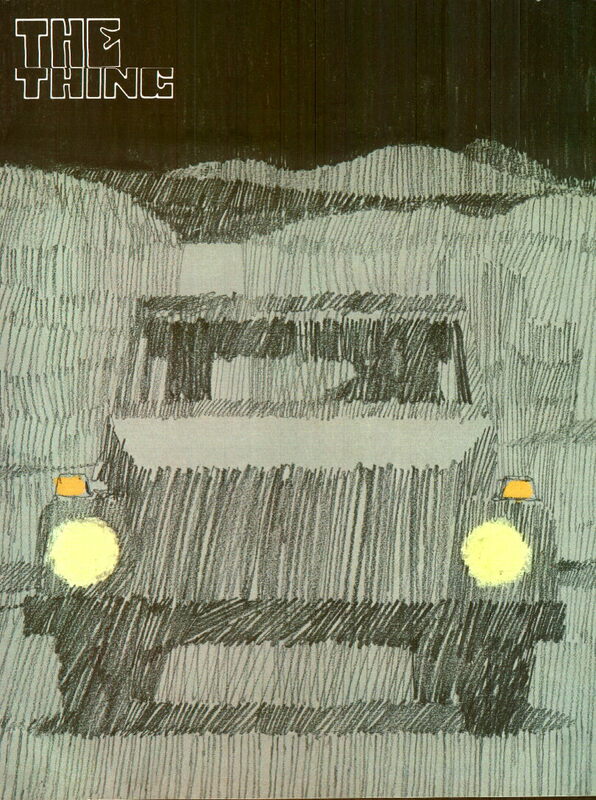 I was proud of the car and how it was different! Certainly, it was unique and distinctive. At one point it caught the attention of a local newspaper reporter. She copied down my tag number, contacted the police, and called. 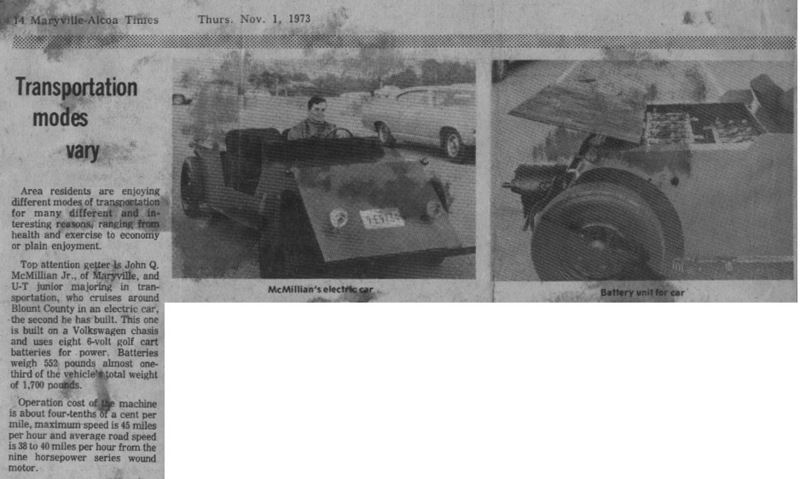 A couple of weeks later, the Maryville-Alcoa Times published in 1973 a very nice article about the car. 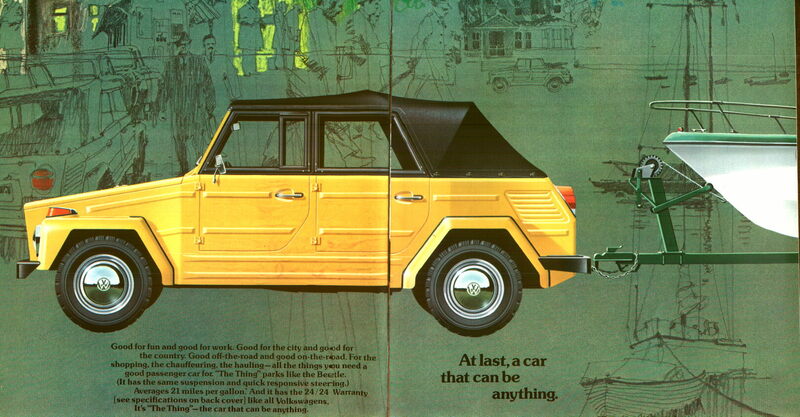 Some say that the little electric looked somewhat like the "VW Thing". Perhaps it did, but that was not my intention. 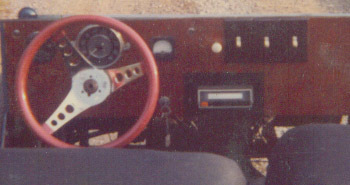 And of course, no sports car would be complete without an 8 track stereo, clearly visible in the center of the dashboard. Also visible is the volt meter just to the right of the steering wheel and the amp meter on the left side of the wheel. As I said, I was proud of the fact that this car was powered by batteries and an electric motor. This was a very large and heavy motor and weighted about 150 pounds! 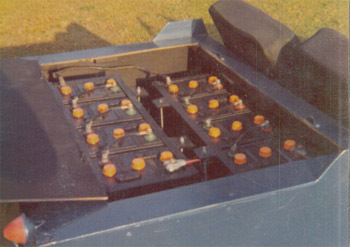 Lifting the rear deck allowed easy access to the battery pack; composed of eight, six volt, golf cart batteries. They were connected in series and provided 48 volts to the motor. The speed of the motor was controlled by using resistance coils.